Knowing when to break a fast is your key to safe fasting. (Assuming you've read Who Can Fast and are sure you're a proper candidate for fasting.) When fasting, our bodies change from normal functioning to that of healing and recuperation. An internal cleansing of toxins and inferior materials can begin because so much energy is now freed up that used to go to digestion. Without eating though, how are we fueling our body? Ketosis is a complex metabolic process used by the body when there is insufficient glucose--the body's main fuel. This is said to be "muscle sparing" as without it, the body would breakdown muscle to provide the components necessary to produce the required glucose. Instead of breaking down muscle tissue, your body will break down fatty deposits, producing ketones for fuel. After about 3 days of water fasting, you will be in the state of ketosis. This state is usually high energy with a clear mental capability. But a unique facet of it is a total lack of hunger. Some fasters, not all, can go for weeks without food and yet never feel hungry. As you might expect, those who are overweight can go longer, whereas thin individuals must stop sooner. But don't let a lot of excess weight fool you into thinking you can go any certain length of time. You don't decide how long to fast. Your body tells you how long it can safely fast. Fasting safely requires we know the other signals to break a fast. Sudden nausea and vomiting after days of feeling comfortable can be a sign of bodily distress. It is usually a sign of dehydration and can sometimes be remedied by ingesting more fluids. But if vomiting is persistent and severe or is accompanied by diarrhea, you should break the fast. Rapid heart rate, drop in heart rate, or irregular heart beat are all signs to end the fast. During a water fast, general weakness developing over time is considered normal as the body seeks to conserve energy, but sudden and extreme weakness should be taken seriously by ending the fast. If any of these conditions present themselves, break the fast with some fresh juice or a small piece of fresh fruit. Watermelon is frequently used to break a fast because of the high water content, but any juicy fruit will do. If using juice, drink 6-8 ounces of diluted juice, sipping slowly. Do this every 2 hours. Side effects such as those above are more common during fasts of longer duration. Shorter fasts of 2-3 days won't usually be accompanied by such symptoms. Listen to your intuition as well. If you're feeling like something may be wrong or something feels "off" to you, maybe you should stop. You can always fast another day. See Guidelines for Breaking a Fast for greater understanding of the breaking process. If we want to have a safe fasting experience, we need to make the space to listen to our bodies. And educate ourselves as much as possible before beginning. Consider getting professional supervision for longer fasts or for treating chronic conditions. Colon Cleansing helps you sort through the options, while this colon cleanse recipe can be used anytime it's needed. 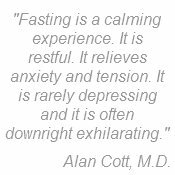 Partial Fasting offers easier and gentler methods of fasting and lots of different ways to do them. Breathing Exercises help cleanse your blood and bodily cells of waste products. Health Conditions Improved by Fasting. See the long list of ailments that are known to respond well to fasting. Fasting Grace - read about an 86 year old woman's use of fasting throughout her life.